The avalanche hazard is MODERATE above and below treeline. New snow, warming temperatures and lingering deeper instabilities in the snowpack warrant careful decision making today. Above treeline pockets of fresh wind slab up to 10" in depth in terrain with a Westerly component have the potential to pull out deeper layers of snow. Below treeline warming temperatures will make it easier for skiers and snowmachiners to trigger lingering pockets of slab in very steep terrain. While there have only been small amounts of occasional snowfall in the month of December, we continue to observe lingering instabilities in our snowpack. Collapsing has been occurring at all elevations for several weeks now. 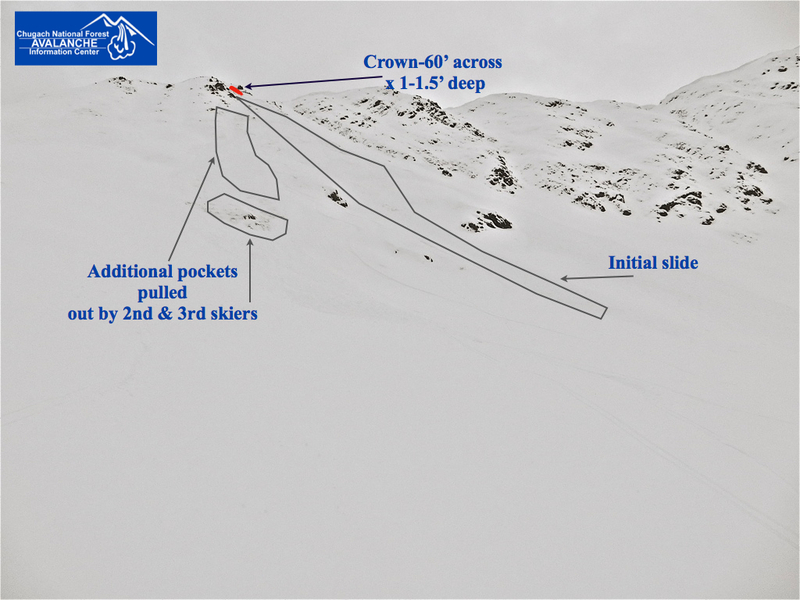 Snowpit results have shown that the potential still exists for skiers and snowmachiners to trigger avalanches in steep upper elevation terrain. This was the case in a skier triggered avalanche that occurred on December 26 (see photo below). Strong winds that cranked on December 23rd helped to create dense slabs that are sitting on weak snow in upper elevation starting zones. Avalanches of late have been sliding on weak snow just above a crust that was formed in early December. It will be important to continue to treat steep slopes over 40 degrees with suspicion today. 3-5” of new snow overnight combined with moderate to strong winds out of the East have created shallow pockets of wind slab in the higher elevations. While these slabs will be relatively small, they will be sensitive to the weight of a person or snowmachine. It is more likely to trigger a newly formed pocket of windslab compared to a deeper, older slab today. However, the potential exists for these smaller avalanches to trigger layers deeper in the snowpack. This 1-2 combo of fresh wind slabs and persistent slabs will make it critical to avoid steep starting zones in the higher elevations today. In the past 24 hour the mountains around Eastern Turnagain Arm have picked up 3-5” of new snow with .2-.3 inches of water. Winds have increased overnight and have averaged 26 mph out of the East since 10pm at the Sunburst weather station. Temperatures have been on the rise as well with Seattle Ridge reading 25 F and Sunburst at 23 F at 6am. Temperatures will continue to rise today into the upper 20s to low 30s F. Snow showers in the higher elevations will lay down another 1-2” of snow today. Light rain and freezing rain will fall between sea level and 1,000’. Precipitation will taper off by early afternoon. Ridegtop winds will be out of the East and Southeast at 25-30mph. The extended outlook is calling for generally dry conditions and mild temperatures over the next several days.